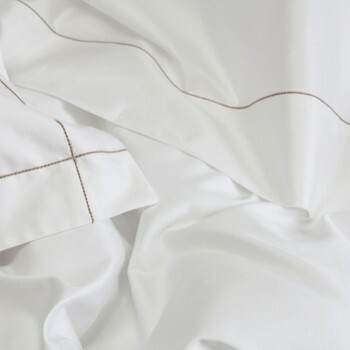 Our generously sized flat sheets are made in Portugal designed with style yet elegance in mind. Coming in a range of thread counts from 280 to 600 in 100% Egyptain cotton or long fibre cotton percale and sateen our flat sheets will ensure a comfortable nights sleep. Throughout the predominantly white designs our collections have a line of different detailing at the head of the sheet with touches of colours inspired by the mediterranean islands such as almond, sky blue, stone, honey, ash, white, navy caramel and mink.